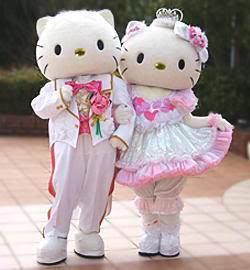 For those of you who are obsessed with "Hello Kitty, "you'll be pleased to know that the Daiichi Hanyu hotel chain in Japan has begun offering Hello Kitty Princess Kitty wedding packages. 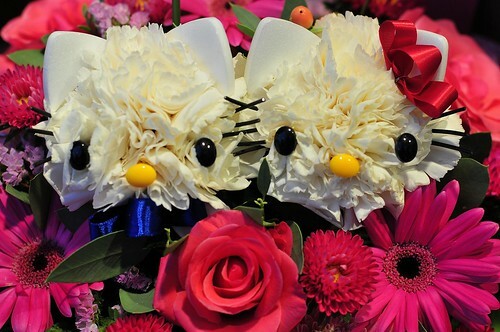 Your ceremony can include "Hello Kitty" and "Dear Daniel" character escorts (best man and maid of honor) for the ceremony. How cool is that? Hong Kong Station. Witnessed by relatives, friends and MTR passengers, bridegroom Jamie and his bride Horlick (who was dressed in the first-ever Hello Kitty wedding gown, jointly designed by the MTR Corporation, Sanrio and Wonderful Arts, (the bride's wedding gown was filled with Hello Kitty patterns made of Austrian crystals.) 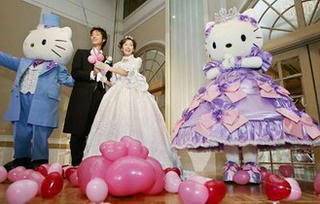 ) with their bridesmaids and groomsmen, boarded the first-ever MTR Hello Kitty Wedding Train and traveled to the MTR Hong Kong Station. The wedding train was specially designed for the occasion with images of Hello Kitty and Dear Daniel dressed as little cupids covering the train body and compartments. The interior was decorated with flowers and ribbons. Kitty, the coulple proceeded to Hong Kong Station, which had been transformed to a wedding hall. 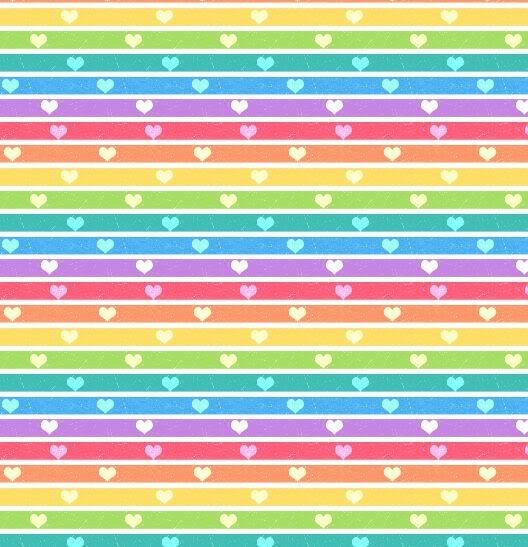 Under the witness of the Civil Celebrant - Mr. Samuel Chan (solicitor), Hello Kitty, Dear Daniel, friends and relatives, (as well as MTR passengers) Jamie and Horlick were married. continually exclaim "kawaii !!!" is 2M yen (40 people). 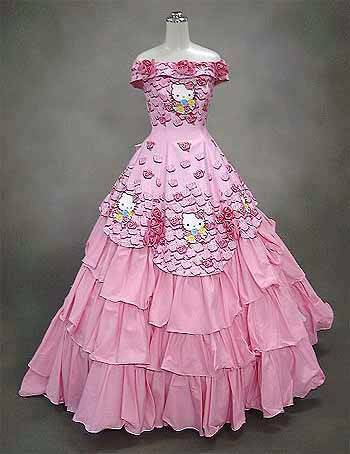 And if you are really into pink, above is a sample of a Hello Kitty Wedding Dress (which would probably work well as a bridesmaid dress : ).